GLENDA by Arter&Citton is a tall polycarbonate bar stool. It is the bar stool version of Glenda, a highly successful chair, imitating its light and fancy features. 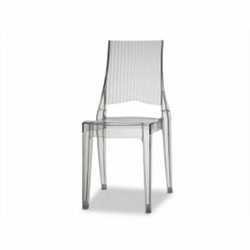 It has a polycarbonate frame with a ruffled backrest, available in four different colours. It is perfectly stackable, and suitable for indoor/outdoor facilities. Size: W47 D54 SH74 H118 cm. Available colours: glossy white, glossy black, transparent, transparent fumé. Minimum order: 2 bar stools or multiples of 2.